THE various stages in the production of the English Prayer Book led also to the form in which our American Book is cast. The English Colonists in America may be divided into two parts. One part — notably those of New England — came because they were dissatisfied with conditions, and particularly with religious conditions, in the home land. These had objected to the strict requirements of conformity to the English Prayer Book that were enforced at home; and when they came to American shores they discarded, for the most part, the use of the Book of Common Prayer altogether. These were the Puritans, founders of what we now know as Congregationalism, which once was almost uncontested in New England. On the other hand, there were other settlers, particularly in Virginia and the Carolinas, who had no desire to change English institutions. These brought with them English chaplains and the English Prayer Book. They built churches, and in Virginia the Church was declared to be "established" or declared by law to be the recognized expression of the religion of the State. Curiously enough, however, the first use of the Prayer Book on what is now American soil was not on the Atlantic but on the Pacific coast. Sir Francis Drake, before serving as vice-admiral in the memorable defeat of the Spanish Armada, set out upon his hardly less memorable cruise around the world. In 1579 his ship's party spent six weeks on shore in what is now California, and it is known that the services of the English Church were there conducted by the chaplain, the Rev. Francis (or Martin) Fletcher. 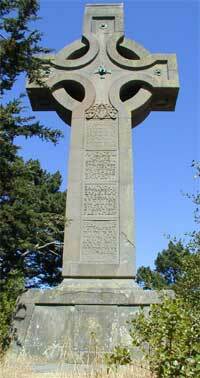 The site of the first service, as near as it can be determined, is now marked by the huge "Prayer Book Cross," erected in 1892 and dedicated on July 26th of that year by the present Bishop-then Assistant Bishop-of California, Dr. W. F. Nichols. A year earlier than this Californian service Frobisher's party had explored the Hudson's Bay country, now a part of Canada, and his chaplain, "one Maister Wolfall," had held services and celebrated the Holy Communion. FACSIMILE OF THE GRANT OF EPISCOPAL JURISDICTION IN AMERICA TO THE BISHOP OF LONDON; FROM GEORGE II. 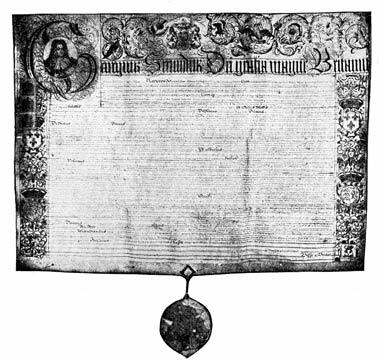 Sir Humphrey Gilbert, with a small party, took possession of the island of Newfoundland in 1583, and the first of the laws promulgated was that the religion of the colony should be "in publique exercise according to the Church of England." Sir Walter Raleigh's colony, in 1584, brought the services of the Prayer Book to Virginia, Thomas Heriot, or Hariot, conducting them. So also his second or "Roanoke" colony, in North Carolina, brought the services of the Church. There, on August 13, 1587, Manteo, an Indian chieftain, was baptized. 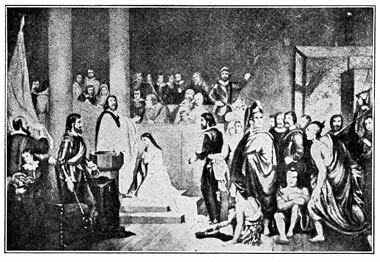 There also, seven days later, Virginia Dare, the first white child to be born on the continent, was brought to life, and the Church was ready to greet her and she was baptized. What became of those colonists and of Virginia Dare is one of the mysteries of history. They had completely disappeared before the next ships arrived from England, though blue eyes and other Anglo-Saxon indications among North Carolina Indians long afterward may probably suggest the fate of some of them. shelter them at their first service on the Sunday after their arrival, with a bough of wood between two trees as a pulpit. In the same year the Rev. Richard Seymour held the Prayer Book services on Mohegan* Island, off the coast of Maine; but it was the Virginia colony that introduced English Churchmanship and the English Prayer Book on to American soil so permanently that they took root and grew into our American Church. PLANTING THE CHURCH IN AMERICA. When the American Revolution broke the political bonds that had held the colonies to the mother country the Church had been planted in them all, even including those in which the original settlers did not want her. She was entirely without bishops, however, and had no representative body. A number of Churchmen, gathered at New Brunswick, N.J., in the interest of a charitable organization, determined to invite representatives of the Church from all the colonies into conference. In October, 1784, that meeting was held in New York, with clergymen and laymen in attendance from eight states. It was determined that a national organization should be effected, and a General Convention was called to meet in Philadelphia in September of the following year. In the meantime the Church in Connecticut had been able to secure the first bishop on the American continent. Dr. Samuel Seabury had been sent across the ocean to obtain consecration; and when the English bishops did not feel able to consecrate him he went to Scotland, where" Non-Juring" Bishops of that Church — Kilgour, Petrie, and Skinner — made him Bishop for Connecticut at Aberdeen on November 14, 1784. Returning to his diocese he met his clergy in convocation on August 2, 1785. There a committee was formed "to consider of and make with the bishop some alterations in the Liturgy needful for the present use of the Church." A week later Bishop Seabury directed his clergy to make a number of changes in using the (English) Prayer Book, such as were required by the changed political conditions. 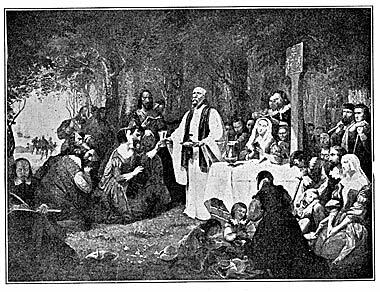 BAPTISM OF THE INDIAN PRINCESS POCAHONTAS. The "General Convention" already referred to met in Philadelphia in September, 1785. The New England Churches were not represented, but there were clerical and lay deputies from seven states — New York, New Jersey, Pennsylvania, Delaware, Maryland, Virginia, and South Carolina. These considered the changes that should be made in the Prayer Book, and their determination was quite drastic. By authority of that Convention a committee consisting of the Rev. Dr. William Smith, of Maryland; Rev. Dr. William White, of Pennsylvania, afterward Bishop; and Rev. Dr. C. H. Wharton, of Delaware, issued what has gone into history as the “Proposed Book.” Much that was proposed was useful and good, but some changes were very serious. The Nicene and Athanasian Creeds were dropped, the clause, "He descended into hell," was omitted from the Apostles' Creed, and there were other serious blemishes. The book thus made was rejected by the Church in each one of the states, and the English bishops, who were being asked to consecrate other bishops for America, raised grave objections to it. Bishop Seabury, addressing his clergy in Connecticut, spoke strongly against it, and urged that Prayer Book revision be delayed until bishops could be obtained from England. He also, in accordance with a "concordat" which he had made with his Scottish consecrators, "set forth and recommended" a Communion Office that was in substance that of the Scottish Non-Jurors, and much more satisfactory than that of the English Prayer Book. The failure of the “Proposed Book” made it necessary for the American Church to begin the work of liturgical revision all over again. Another General Convention met, also in Philadelphia, in October, 1789. In the meantime Dr. William White had been consecrated Bishop of Pennsylvania, and Dr. Samuel Provoost, Bishop of New York, by English bishops. The Convention met, therefore, with a House of Bishops consisting of Bishop Seabury and Bishop White, Bishop Provoost being detained by illness, and a House of Clerical and Lay Deputies. The English Prayer Book was again taken up for revision. Two weeks were devoted to the matter, and the American Book of Common Prayer, extending to the end of the Psalter, was set forth. In the main this is the form in which we know the Prayer Book to-day. Bishop Seabury's Communion Service, derived from the Scottish Church, and said by liturgical students to be far superior to any other Anglican liturgy, was adopted for the new book. The chief other variations between the American and the English uses have already been stated. 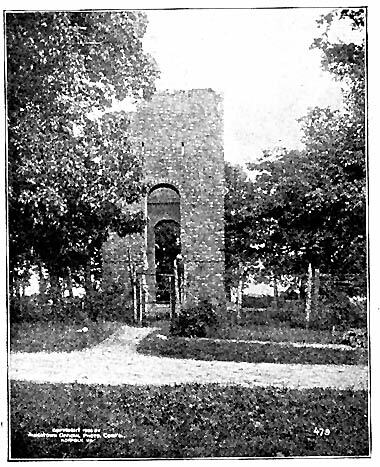 RUINS OF OLD CHURCH TOWER, JAMESTOWN, VIRGINIA. In 1792 the Ordination services were appended, being substantially identical with those of the English Church. The Form of Consecration of a Church dates from 1799, and is in substance one that was drawn up by Bishop Andrewes in 1620. The Thirty-nine Articles of the Church of England, omitting one and with an explanatory note to another, were ordered to be bound with the Book in 1801. 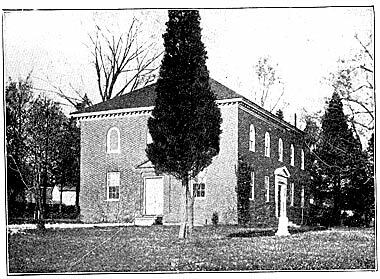 In 1804 the Institution office, amended in 1808, was added, having, in substance, been adopted by the clergy of Connecticut in 1799. This is especially notable from the fact that, alone of Prayer Book offices, it gives us the terms "Altar" and "Holy Eucharist," while it also declares the relation of a rector with his people to be a "sacerdotal connection," and authorizes him to "perform every act of sacerdotal function" among the people of his parish, he "continuing in communion" with his bishop and obeying the rubrics and canons of the Church and the "lawful directions" of the bishop. Here Prayer Book revision ceased in the American Church until 1880, except that in 1835 "north side" was changed to "right side" in the third rubric at the beginning of Holy Communion. At the General Convention of 1880 the latest revision of the Book was commenced by a resolution introduced by the Rev. Dr. William R. Huntington, of Massachusetts, afterward of New York, calling for a commission of seven bishops, seven presbyters, and seven laymen to consider whether there were occasion for "alterations in the Book of Common Prayer in the direction of liturgical enrichment and flexibility of use." That committee, of which Bishop Williams, of Connecticut, was chairman, and in which Dr. Huntington was a leading member, reported a series of proposed changes which were incorporated in the "Book Annexed." The changes were carefully considered in the General Conventions of 1883, 1886, 1889, and 1892, and in the latter year the work was completed, and our present Prayer Book took the form that it has since retained. In general the changes made the Book conform more closely to that of the Church of England, except in the Communion Service, and great care was taken to compare the text with earlier standards. Together with the Psalter or Psalms of David."